The Strathcona 1890 Truck Farm was inspired by the original Truck Farm in Brooklyn, New York. It was launched in 2012 with help from the City of Vancouver & Vancouver Foundation Neighbourhood Small Grants Program. Our primary focus is to inspire and educate people about growing food in small urban spaces. If we can grow it in the back of a ’93 Mazda pick up truck, what’s stopping you. 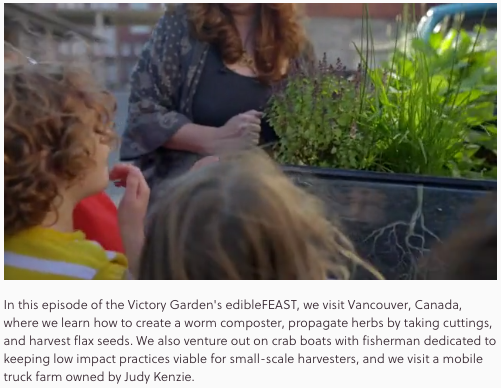 As well, here is a recent episode to the new and improved Victory Garden’s Edible Feast which not only will give you insight into what the Truckfarm is all about but also introduce you to some other amazing local food advocates. The people behind the show are all incredibly talented and the show itself is magical. I hope you will take a little time to watch not only the episode with the Truckfarm, but some, if not all, of the others. Amazing people doing incredible things in the name of good, local food practices.